Lio de Bruin has a tremendous passion for both materials and textiles. Through an intuitive approach she works with various techniques, colours and materials. She designs concepts that are full of textures, structures and rhythm. With Compose, De Bruin researches weaving techniques she’s very much inspired by. 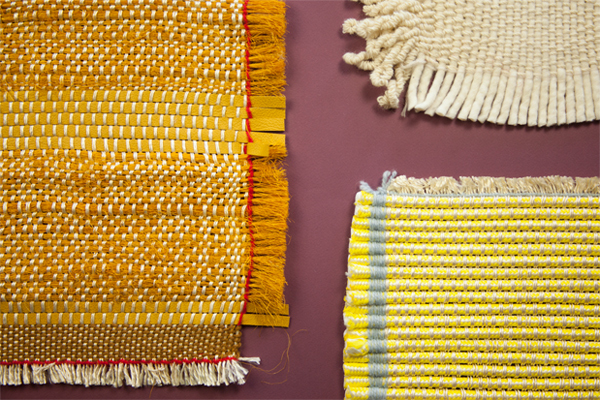 She experiments with weaving patterns, lines, surfaces and colours. During the making process new designs for wall and floor carpets pop up. She uses materials which vary from wool and linen to rope and leather. At HOW&WOW – Studio De Bruin showcases her samples. The samples illustrate her way of thinking and represent her work as a designer. It comes naturally that these samples are transformed into fabrics with a dynamic blend in colour and texture. De Bruin explores collaborations with various design brands, private individuals and the industry. She investigates how her experiments can have a different function in new processes. The power of the tangible craft always plays a central role in this.